With all the discussion going on in the other thread about PSSC (SoCal) and the Palm Journal, I thought it was quite a coincidence that just yesterday I reached a substantial milestone in publishing myself. In 1966 - 42 years ago - I decided to start a little aviation publication, more as a hobby than anything else. I only had 35 subscribers. I called it "Aviation-Letter", and began publishing it on a monthly basis. The number of subscribers kept growing, and as of issue #10 I had about 115 subscribers and decided to go for broke and have it printed at a real printshop, with photos (OK, B&W, but still). At the time I needed 500 subscribers to reach break-even - a number I thought I'd never see. Well, the numbers kept growing, and the number of pages in the magazine kept growing as well. For many years, each issue would have, on average about 24 pages. Today, it can be anywhere from 64 to 80 pages. That's each and every month. I did all the work myself up until 1995 and then I had to hire an assistant editor, Nigel P., who at the time lived outside Manchester, England (he has since moved to Orlando). The editorial team has continued to grow, and we now have five assistant editors. See below. I decided to delete their last names and all contact info since I didn't ask them for permission to post it here. Interestingly, 3 of the 5 assistant editors are named Nigel. (Must have been a desperate shortage of boys' names in England at the time.... We refer to them as N1, N2 and N3!). The milestone I reached last night was that I finished the final edit on issue #500. So, five hundred issues in 42 years. And never ever missed a deadline, not even by a single day. So, when I hear about the difficulties the PSSC is going thru with its Palm Journal and the team efforts that are necessary to get back on track, I believe my own experience gives me a unique perspective on what's involved. Our team involves 7 people; myself and five assistant editors, plus a production/distribution manager in England. In other words, we are spread out over two continents, several different time zones. I do the final edit here in Hawaii, send the document to the printer in England via e-mail attachment, and then the magazine is mailed out of London a few days later. In addition to this, we have hundreds of contributors on all the continents (well, except Antarctica) and we communicate with most of them on a very regular basis, sometimes several times a week. Editor: Bo-Göran Lundkvist, P.O. Box 2071, Pahoa, HI 96778-2071, USA. Main responsibility: Boeing jetliners, Airline & Route News, INFO-REQ. Assistant editor:	Nigel P., Orlando, FL, USA. Main responsibility: turboprop airliners, executive jets. Assistant editor:	Brian B., Memphis, TN, USA. Main responsibility: all Western built jetliners except Boeing. Assistant editor:	Nigel H., Cheshire, England. Main responsibility: military transports, piston engined transports. Assistant editor:	Nigel H., Hertfordshire, England. Assistant editor:	Daniel W., Cheshire, England. Main responsibility: twin turbine helicopters, small business turboprops. U.K. OFFICE: John R. R., Middlesex, ENGLAND. ABX has been notified by DHL that 23 of its DC-9s that have been dedicated to DHL service are no longer needed and will be phased out from 30/6/08, through 31/12/08. AEGEAN AIRLINES began Athens-Tirana service on 19/5/08 with six weekly RJ100 flights. AER LINGUS will terminate Dublin-Los Angeles service on 2/11/08. AEROFLOT RUSSIAN AIRLINES began Moscow SVO-Bratislava service on 27/5/08 with two weekly Tu-154M flights, Moscow SVO-Split on 3/6/08 with two weekly Tu-154M flights, ...is using its one remaining operational IL-62M on the Moscow-Jeddah-Luanda route, ...only two IL-86s are still operated and primarily used for back-up on the Moscow SVO-Dubai route. AEROMEXICO TRAVEL began domestic charters on 1/6/08 with two DC-9-83s and one DC-9-87, all still in full Aeromexico colors with “Travel” painted below the Aeromexico titles. AIR BERLIN has started Düsseldorf-Tbilisi service with four weekly Boeing 737-800 flights. AIR BISSAU INTERNATIONAL has started Bissau-Conakry and Bissau-Dakar service with three weekly F-27 flights and Bissau-Lisbon with a once weekly Boeing 737-700 flight and Bissau-Luanda with two weekly 737-700 flights. AIR BURKINA has started Ouagadougou-Accra service with four weekly DC-9-87/SAAB 340 flights. AIR CALIN began Noumea-Seoul ICN service on 22/6/08 with two weekly Airbus A330 flights. AIR CHINA began Beijing-Taipei service on 4/7/08 with an Airbus A330. It also began Beijing-Kaohsiung service on 4/7/08. AIR IVOIRE has started Abidjan-Bordeaux service with a once weekly Airbus A321 flight. AIR MALTA has started service from Malta to Leipzig and Bologna with two weekly Airbus A319 flights. AIR MAURITIUS began Mauritius-Banglore service on 29/4/08 with a once weekly Airbus A330 flight. AIR MOLDOVA will begin Chisinau-Antalya service with three weekly EMB-120 flights and Chisinau-Kiev with a once weekly EMB-120 flight. AIR NEW ZEALAND will begin Auckland-Beijing service on 7/8/08. AIR UGANDA began service from Entebbe to Zanzibar and Khartoum on 1/6/08 with two weekly DC-9-87 flights, ...has added service from Entebbe to Dar es Salaam and to Kilimanjaro with three weekly DC-9-87 flights. AL SAEEDA (FELIX) AIRWAYS is a new carrier based in Sanaa, Yemen, and owned by Yemenia (25%) as well as private Yemeni investors as well as investors in other Arab countries. It is planning to begin operations in 2008, serving 16 domestic airports. AMERICAN AIRLINES will terminate service to Oakland, CA, and Barranquilla in September 2008. AMERICAN EAGLE AIRLINES will terminate service to San Luis Obispo CA, Albany NY, Providence RI, Harrisburg PA and Samana, Dominican Republic. ARKIA has started service from Tel Aviv to Tbilisi with a once weekly Boeing 757 flight. AURELA has started Vilnius-Almaty service with a once weekly Boeing 757-200 flight. BANGKOK AIRWAYS has started Bangkok BKK-Macau service with a daily A319 flight. BELLE AIR began Tirana-Pristina service on 17/5/08 with three weekly DC-9-80 flights. BRITISH AIRWAYS has agreed to acquire L’Avion and will integrate the French airline with its Openskies subsidiary. BURAQ AIR will begin Boeing 737-800 service from Tripoli and Benghazi to Zürich on 2/8/08. CARPATAIR is now operating Timisoara-Thessaloniki with three weekly SAAB 2000 flights, ...will begin Bucharest OTP-Kiev service on 2/8/08 with three weekly SAAB 2000 flights. CHINA SOUTHERN AIRLINES has started service from Urumqi to Asgabat and Dushanbe. CIRRUS AIRLINES has started Cologne-Geneva service with two daily Do328 flights. CLICK AIR will begin Barcelona-Ljubljana service on 6/8/08 with two weekly Airbus A320 flights. CLUB 328's licence was revoked by the CAA in June 2008. Its 125s G-BYHM and G-WYNE are parked at Biggin Hill. CONTINENTAL AIRLINES will terminate the following services on 3/9/08; Houston IAH-Washington IAD, IAH-Oakland, Newark-Cologne, Newark-Salt Lake City, Cleveland-IAD and Guam-Denpasar. It will also cease service from Houston IAH to Cali, Chattanooga, Guayaquil, Hartford, Monclova, Montgomery, Palm Springs, Reno, Sarasota and Tallahassee. COPA AIRLINES will begin Panama City-Belo Horizonte service on 21/8/08. CSA CZECH AIRLINES will lease two CFM56 powered A319-100s from BOC Aviation for delivery in 2009 and 2010. DELTA AIR LINES will begin New York JFK-Buenos Aires EZE service on 18/12/08 with five weekly Boeing 767 flights. 9/6/08 YA-MGA, Mi-8MTV-1 (95603) of Mesopotamia Group damaged by shrapnel from a rocket. 9/6/08 Helicopter (type ?) of Tanzanian Air Force crashed near Arusha, northern Tanzania. 6 killed, helicopter w/o. 10/6/08 ST-ATN, A310-324 (548) of Sudan Airways crashed on landing at Khartoum and burned out. 30 of at least 200 killed. 11/6/08 Cessna T-37 of Pakistan Air Force crashed near the city of Mardan, about 60 km NW of Peshawar, North West Frontier Province, Pakistan. Pilot killed, aircraft w/o. 11/6/08 363/4-BK, Mirage 2000N of French Air Force cr. near Merdrignac, west of Rennes. 2 crew ejected safely, aircraft w/o. 13/6/08 164657, F-18C and 160965, F-5F Tiger of U.S. Navy collided in midair and crashed about 80 km east of Fallon NAS, Nevada. 1 killed, both aircraft w/o. 13/6/08 Mil Mi-17 of Venezuelan National Guard experienced problems when landing at Fort Tiuna, w/o. 15/6/08 B-3841, Harbin Y-12-II of China Flying Dragon Aviation crashed into a hill near Chifeng. 3 killed, w/o. 16/6/08 Harrier GR7 of Royal Air Force crashed on farmland near the village of Ashwell in Rutland. Pilot ejected, aircraft w/o. 18/6/08 RA-….., Tu-134 of UTair undercarriage collapsed returning to land at Kaliningrad after experiencing engine problems on takeoff. The aircraft veered off the runway and caught fire. All 70 occupants survived. 18/6/08 N656WA, DHC-6-100 (47) of Wiggins Airways dived into the ground on takeoff from Hyannis, MA, on a freight flight bound for Nantucket. Only reached about 70m altitude. 1 killed, w/o. 19/6/08 520/30-SO, Mirage F1B of French Air Force crashed on landing at Colmar Air Base. Both crew members ejected safely. 19/6/08 EC-..., helicopter (type ?) used by the EU’s Eufor peacekeeping mission crashed north of the town of Travnik in central Bosnia. All 4 on board killed, helicopter w/o. 20/6/08 LN-SFT, SA226T Merlin 3B (T-342) of Helitrans crashed into sea near Sotra, 15km west of Bergen, while on a training flight. 3 killed, w/o. 20/6/08 L39 of Hungarian Air Force crashed near Fehérgyarmat Airport in eastern Hungary. 2 killed, aircraft w/o. 20/6/08 Helicopter (type ?) of Thai Army crashed in Yala province in southern Thailand. All 10 believed killed. 21/6/08 HA-MBC, An-2R (1G161-08) of Air Patrol hit trees on takeoff from Krems-Gneixendorf, w/o. 21/6/08 FT-7 Shenyang of Pakistan Air Force crashed near Faisalabad, Pakistan. Both pilots ejected safely, aircraft w/o. 21/6/08 SA.341G of Lebanese Armed Forces crash landed in the Bekaa Valley, Lebanon. No casualties. 22/6/08 N29DJ, L-29 Delfin (892806) crashed shortly after taking off from Millville Municipal Airport, NJ. 2 killed, aircraft w/o. 23/6/08 HB-XWJ, Agusta A109K2 (10010) of Rega crashed on approach to land at the hospital in Samedan. 25/6/08 N311AV, Beech 200 (BB-336) of Colemill Enterprises Inc. main undercarriage collapsed on landing at Key West, FL. 25/6/08 Two Chinese Air Force J-8 jet fighters collided in midair and crashed into a residential area in the suburbs of Hohhot, the capital of northern Inner Mongolia region. Both pilots ejected safely, both aircraft w/o. 26/6/08 A-2106, IPTN NC-212-200 (228/N68) of Indonesian AF crashed in a remote gorge near Pasir Gaok village, Tenjolaya, West Java, while on a mapping survey flight from Jakarta HLP. 18 killed, w/o. 27/6/08 ST-ARN, An-12 (8346010) of Juba Airways crashed north of Malakal en-route from Khartoum to Juba in bad weather. 7 killed, 1 survived, w/o. 27/6/08 N458PS, Do328-110 (3068) was destroyed in a hangar fire at San Marcos while being prepared for delivery to Cirrus Airlines as D-CIRM. One mechanic suffered minor burns. 27/6/08 An-2 crashed 9 km from Bolshoye Gryzlovo whilst on an aerial photography flight. 5 killed, w/o. 27/6/08 H-06, Agusta A109BA of Belgian Air Force crashed at Halleux, about 5 km west of La Roche-en-Ardennes. No casualties. 27/6/08 TG-..., helicopter (type ?) crashed into a mountain near Peten in northern Guatemala, after a flight from Guatemala City. All 4 killed, helicopter w/o. 28/6/08 N799AX. 767-281F (23432/145) of ABX Air in DHL c/s was damaged by fire in the cockpit area while parked at San Francisco. Damaged beyond repair. 29/6/08 N......, two Bell 407s collided and crashed east of Flagstaff Medical Center, AZ. One was operated by Air Methods and the other by Classic Helicopters, 6 killed, both helicopters w/o. 30/6/08 RA-85667, Tu-154M (89A825) of Aeroflot Russian Airlines suffered an uncontained failure of the left engine during its takeoff run from St. Petersburg. 30/6/08 ST-WTB, IL-76 (1003499994) of Ababeel Aviation crashed immediately after takeoff from Khartoum. 4 killed, w/o. 1/7/08 PT-MEE. Cessna 208B (0344) of TAM Jatos Executivos Marilia lost oil pressure and carried out a forced landing while en route Belem-Itiatuba, sustaining considerable damage. No casualties. 1/7/08 Agusta Bell 212 of Italian Navy crashed near Crispiano. 1 killed, 2 injured. 2/7/08 DHC-6 of Chilean AF hit electricity cables and crashed near La Lobada, Southern Chile, 3 killed. 2/7/08 RA-22599, Mil Mi-8T (7895) of UTAir Aviation crashed on landing at the Varginsky oil field in the Yamal-Nenetsk region. 9 killed, 7 survived, helicopter w/o. 2/7/08 YV1165, Piper PA-31T (7820067) flew into high terrain en route San Cristobal-Charallave. 3 killed, w/o. 2/7/08 UH-60 Blackhawk of U.S. Army was hit by a rocket propelled grenade and crashed in a province bordering the province bordering Kabul. No casualties. 3/7/08 OM-ORO, Mil Mi-8P (10448) of Tech-Mont Helicopter Company crashed in a forest 8 km north of Brusno, Slovakia. 3 killed, helicopter w/o. 6/7/08 N199US, DC-9-15F (47153/185) of USA Jet Airlines crashed on a flight from Hamilton, Ontario, to Saltillo, Mexico, while transporting car parts. 1 killed. More details in AL-501. The main section, Civil Aviation News, probably takes up 70-75% in A-L. Despite its name, there is some military information if it involves transport aircraft or executive jets. C.A.N. primarily deals with transactions of individual aircraft, airliners as well as executive jets, as well as interesting sightings, storage information and anything related to these activities. We cover ALL airliners, worldwide. Here's a snapshot of the beginning of the Boeing section. These are all older Boeing jets. The 5 digit number is Boeing's 'manufacturer's serial number', also referred to as "c/n" for construction number. This number is on a dataplate in the aircraft and stays with the aircraft its entire life. The second piece of info is the specific type designation and the third number (in parenthesis) is Boeing's so called line number. Line number 1 would indicate that this was the very first aircraft (of that type) to roll off the production line. (100) would be the 100th etc etc. The 4th piece of info the aircraft's registration number. U.S. registered aircraft always use "N" as a prefix. Different countries use different prefixes. 9Q is Congo, D2 is Angola, HC is Ecuador, etc etc. BOEING c/n 18384 720-051B (237) N720H Honeywell International Inc., broken up at Phoenix 21/6/08. 18748 707-351C (379) N80AZ David Tokoph, seen still WFU at Addis Ababa 6/6/08. 19085 727-22F (349) N192FE seen still WFU at Denver 14/6/08 without a reg and in full FedEx c/s. Used for ground training. 19152 727-22 (507) 9Q-CEV seen WFU at Malabo 19/6/08 in “tatty” but complete condition. 19374 707-321B (658) D2-MAY Angolan Government, seen still stored at Tel Aviv 25/6/08. 19587 707-323C (686) 9Q-CWG Wimbi Dira Airways, seen at Kinshasa FIH 6/6/08. 19650 747-121F (24) N617FF Logistic Air, ferried Marana-Houston IAH-Tripoli 26/6-27/6/08 after storage. 19691 727-134 (487) HC-BLE TAME Ecuador, returned to Ecuadorean Air Force 28/2/08 as FAE 691 in all white c/s. 20029 707-321B (790) N707AR Omega Air Inc., seen at Victorville 25/6/08. 20417 737-204F (255) CC-CSD LAN Cargo, last service early 3/08 Montevideo-Santiago SCL. Now WFU at SCL. 20458 737-205C (278) 9M-PMM Gading Sari Aviation Services, seen at Kuala Lumpur SZB 1/6/08. 20496 737-242C (268) N2409N Logistic Air Inc., sold 6/6/08 to Air North Charter & Training Ltd.
20506 737-281 (280) HS-VKU seen still WFU at Jakarta CGK 20/6/08 in Phuket Airlines c/s without engines. 20576 737-268 (297) J2-KCC seen still stored at Addis Ababa 6/6/08 in basic Saudia c/s. Believed permanently retired. 20609 727-227 (892) F-GCGQ seen still WFU at Perpignan 20/6/08 in Belair c/s. 20789 727-230 (1015) N359PA seen still WFU at Perpignan 20/6/08. 20822 727-2H3 (996) F-GGGR seen still WFU at Perpignan 20/6/08 in Belair c/s. 20838 727-227F (1017) N196AJ United States Department of Justice, Landover, MD, rgd. 20/6/08. 20917 737-210C (344) N834AL Aeko Kula Inc., Seattle, WA, rgd. 20/6/08. Operated by Aloha Air Cargo on lease. 20975 727-256 (1080) 5N-BEC Trans Sahara Air, seen still WFU at Addis Ababa 6/6/08. 20989 727-223 (1144) XU-RKJ seen parked at Hanoi 26/6/07 in red and white c/s with large “Air Dream” titles and somewhat smaller “Operated by R.K.A.” titles (Royal Khmer Airlines). 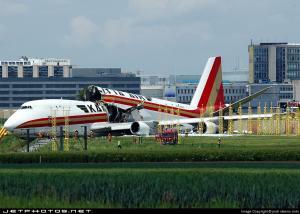 The aircraft was still parked at Hanoi as of 11/6/08, reportedly “abandoned”, its fate in question. BOEING c/n 21155 727-251 (1169) 3D-AVC seen at Abidjan 24/6/08 in all white c/s without titles. 21184 737-205 (440) YV206T El Sol de America, seen at Caracas 12/2/08 in basic Global Air c/s with El Sol de America titles. 21352 747-238B (310) J2-KCB RAK Link Airways, seen at Kuala Lumpur SZB 1/6/08. 21384 727-223 (1328) PK-JGN seen still WFU at Jakarta CGK 28/6/08 in Jatayu Air c/s. 21450 727-225 (1308) N674MG AFS Investments IX LLC, sold 12/6/08 to Grand Holdings Inc.
21458 727-212 (1327) N292AS CSDS Aircraft Sales & Leasing Inc., Torrance, CA, rgd. 25/6/08. 21536 747-236B (328) G-BDXG – see 499/26. Wings were cut off already 2/06 and the tail early 4/08, so the report in 499/26 is misleading. See comments for 22385 below. 21645 737-219 (535) A6-PHF AVE.com, seen at Djibouti 6/08. Cannot be UN-B3709. See 499/26. See 23912 below. 21650 747-2R7F (354) G-MKGA MK Airlines, seen parked at Luxembourg 11/6/08. 21732 737-2H6 (559) PK-RIN seen WFU at Jakarta CGK 28/6/08 in Mandala Airlines c/s. 21820 737-210 (578) PK-RIJ seen WFU at Jakarta CGK 28/6/08 in Mandala Airlines c/s. 21841 747-245F (472) G-MKFA MK Airlines, arrived at Filton 6/6/08. Still at Filton as of 11/6/08. 21864 767-222 (4) G-CECU seen still stored at East Midlands Airport 28/5/08, still with UK International titles. 21868 767-222 (10) HS-SSC Skystar Airways, correct name is “Thaiveha”. Corrects 499/27. 21880 767-222 (50) N620UA Wells Fargo Bank Northwest, reg. cancelled 2/6/08. Exported to Thailand. 21904 727-222 (1528) N346PA Pan Am Railways Inc., reg. cancelled 6/6/08. Exported to Bolivia. 21938 747-212B (436) J2-KCV seen still stored at Opa-locka 18/6/08 in Air Plus Comet c/s. 21982 747-228B (428) N728SA CF6-50 LLC, seen still WFU at Stewart, NY, 14/6/08 in all white c/s and still marked as F-GCBA. 21984 727-231 (1574) N984RT Bank of Utah, seen still stored at Opa-locka 18/6/08 in Platinum Air c/s and without engines. 21986 727-231F (1580) 9Q-CAA Compagnie Africaine d’Aviation, seen at Kinshasa FIH 6/6/08. 22020 727-2S7 (1592) N681CA Grand Holdings Inc., sold 12/6/08 to Liberty Air Inc. Sold 12/6/08 to Paxair LLC. Seen stored at Opa-locka 18/6/08 in Champion Air c/s. 22022 737-205 (616) N771LS Arrivair LLC, seen at Opa-locka 18/6/08 in a white c/s with a thin red and blue cheatline. Being parted out. 22061 737-2H4 (639) XU-RKA seen at Abidjan 25/6/08 without titles. 22127 737-230 (745) CC-CQS LAN Airlines SA, sold 30/5/08 to Wells Fargo Bank Northwest as N227AG and rgd. 11/6/08. 22169 747-2S4F (472) G-MKAA MK Airlines, arrived at Filton 28/1/08. Still at Filton as of 11/6/08. 22215 767-232F (17) N741AX was converted to freighter 12/07 and ferried Porto Alegre-Atlanta 14/12/07 still in basic Delta Air Lines c/s, after the cargo conversion was completed. Adds to 499/27. 22237 747-249F (460) G-MKEA MK Airlines, arrived at Filton 3/1/08. Still at Filton as of 11/6/08. 22304 747-236BF (502) N362FC Cargo Aircraft LLC, ferried Victorville-Honolulu 28/6/08. For lease to Air Atlanta Icelandic. 22317 767-223F (109) N315AA 767 Aircraft One LLC, converted to freighter by Aeronavali and then ferried Venice-Wilmington OH 2/7/08. 22318 767-223F (111) N316AA 767 Aircraft One LLC, reg. N761CX reserved 11/6/08. 22319 767-223F (112) N317AA ferried Tel Aviv-Shannon-Bangor-Victorville 5/6/08 after conversion to freighter. Ferried Victorville-Wilmington OH 21/6/08 on lease to Air Transport International. Adds to 499/27. And since the above are older Boeing jets, here's an excerpt of some of the newest ones. Most of the ones below are Boeing jets that were delivered during the month of June, so this is very up-to-date information. Incidentally, the "/W" after the type means that the aircraft is equipped with so called "blended winglets". 36574 737-8AS/W (2635) EI-DYL r/o 21/5/08, f/f 29/5/08 as N1786B, delivered 11/6/08 to Ryanair as EI-DYL. Rgd. 11/6/08 to Ryanair Ltd. Ferried Boeing Field-Dublin 11/6-12/6/08 as RYR800L. Ferried Dublin-East Midlands 13/6/08 as RYR002P. 36575 737-8AS/W (2636) EI-DYM r/o 16/5/08, f/f 30/5/08 as N1787B, delivered 11/6/08 to Ryanair as EI-DYM. Rgd. 11/6/08 to Ryanair Ltd. Ferried Boeing Field-Dublin 11/6-12/6/08 as RYR800M. Entered service 13/6/08 Dublin-Stansted as FR226. 36576 737-8AS/W (2637) EI-DYN r/o 19/5/08, f/f 29/5/08 as N1796B, delivered 12/6/08 to Ryanair as EI-DYN. Rgd. 12/6/08 to Ryanair Ltd. Ferried Boeing Field-Dublin 12/6-13/6/08 as RYR800N. Entered service 14/6/08 Dublin-Madrid as FR7156. 36604 737-8FE/W (2650) VH-VUP r/o 2/6/08, f/f 12/6/08, delivered 27/6/08 to Virgin Blue Airlines, named “Holly Hunter”. Ferried Boeing Field-Lihue-Nadi-Brisbane 27/6-29/6/08. 36605 737-8FE/W VH-VUQ for Virgin Blue Airlines. Not 36606. Corrects 499/38. 36625 737-7H4/W (2591) N919WN Southwest Airlines Company, rgd. 10/6/08. 36626 737-7H4/W (2600) N921WN Southwest Airlines Company, rgd. 13/6/08. 36627 737-7H4/W (2634) N923WN r/o 15/5/08, f/f 2/6/08, delivered 9/6/08 to Southwest Airlines. Ferried Boeing Field-Phoenix 9/6/08 as SWA8700. 36628 737-7H4/W (2640) N924WN r/o 21/5/08, f/f 3/6/08 as N1786B, delivered 26/6/08 to Southwest Airlines as N924WN. Ferried Boeing Field-Phoenix 26/6/08 as SWA8700. 36719 737-7BD/W (2589) N347AT, to 5N-MJH Arik Air, named “Margaret”. Equipped with blended winglets from the very beginning. Adds to 499/38. 36720 737-7BD (2628) N348AT r/o 9/5/08, f/f 19/5/08 as N1786B, delivered 4/6/08 to AirTran Airways as N348AT. Ferried Boeing Field-Miami 4/6/08 as TRS9554. Seen at Orlando MCO 24/6/08 with blended winglets. 36721 737-7BD (2646) N349AT r/o 28/5/08, f/f 5/6/08 as N1786B, delivered 20/6/08 to AirTran Airways as N349AT. Ferried Boeing Field-Miami 20/6/08 as TRS9355. 36809 737-86N/W (2647) LN-NOF r/o 29/5/08, f/f 9/6/08 as N1786B. Seen at Boeing Field 10/6/08 as N1780B. Delivered 26/6/08 to GECAS as LN-NOF and leased to Norwegian Air Shuttle. Ferried Boeing Field-Keflavik-Oslo 26/6-27/6/08 as NAX7382. 36810 737-86N/W B-5196 for GECAS/Air China. 37095 737-924ER/W (2651) N38424 r/o 2/6/08, f/f 13/6/08, delivered 27/6/08 to Continental Airlines. Ferried Boeing Field-Los Angeles 27/6/08 as COA9971. Selcal GJ-ER. 37111 737-7JR (2595) N721BA Bank of Utah, rgd. 11/6/08. “Final delivery” reported as 9/6/08. Ferried Georgetown, DE-New Iberia ARA on 9/6/08. 37303-304 747-4HQERF 9K-DAA, 9K-DAB for Loadair Cargo. Not 37307, 37308. 37550 767-346ER (969) JA619J r/o 12/6/08, f/f 23/6/08, delivered 30/6/08 to Japan Airlines International. Ferried Everett-Tokyo NRT 1/7-2/7/08 as JAL7901. 37560 737-9JAER/W (2664) N376BJ seen at Renton 22/6/08 in green primer. Seen at Boeing Field 28/6/08 as N1786B. 37594 737-8K2/W (2594) PH-BGB KLM, English name is “Whimbrel”. Corrects 499/38. 37664 777-32WER (727) N5573S ferried Everett-Portland PDX 10/6/08 in primer as BOE936. Painted in full TAM c/s and ferried PDX-Everett 17/6/08 as BOE936, named “The Magic Red Carpet”. 37708 777-F6N N772LA for GECAS/LAN Airlines. 37710 777-F6N N774LA for GECAS/LAN Airlines. 37740 737-86J/W (2638) D-ABKB r/o 4/6/08, f/f 14/6/08, delivered 26/6/08 to Air Berlin. Ferried Boeing Field-Keflavik-Berlin TXL 26/6-27/6/08 as BER001. TUPOLEV TU-134A c/n 60035 RA-65563 Flight Air Company, seen in ARZ-412 at Rostov 27/6/08 in primer. Tu-134A-3. 62215 UR-65757 Air Ukraine, seen at Kiev KBP 4/6/08 being scrapped. 62545 UP-T3403 Jet Airlines, seen at Almaty 17/6/08. Ex UN-65766. Tu-134A-3. C/n not confirmed. 63690 RF-65990 Russian Air Force, seen in ARZ-412 at Rostov 27/6/08. Tu-134A-3. 64425 Russian Air Force, seen at Minsk MHP 12/5/08 in bare metal. Tu-134UBL. TUPOLEV TU-154M c/n 85A716 EP-MCQ Iran Air Tours, seen at Teheran THR 14/6/08 with titles being applied. Ex RA-85140. 85A721 RA-85612 Globus, seen at Barcelona 14/6/08 in full Globus c/s. 86A724 RA-85146 Atlant-Soyuz Airlines, for Iran Air Tours as EP-MCP. 86A743 RA-85038 Kavminvodyavia, for Iran Air Tours as EP-MCR. 87A761 RA-85632 Globus, seen at Novosibirsk 26/4/08 leaving paintshop. 87A762 RA-85633 Globus, seen at Nizhniy Novgorod 1/6/08 in all white c/s without titles. 88A772 RA-85640 Aeroflot-Don, seen at Barcelona 14/6/08 in full new Aeroflot-Don c/s. 88A793 EY-85651 Taban Air, seen at Ahwaz 5/5/08 and Teheran THR 7/6/08. 88A795 RA-85653 S7 Airlines, for Iran Air Tours as EP-MCS. 90A853 RA-85685 UTair, seen at Moscow VKO 8/6/08. 90A860 EP-MCT Iran Air Tours, seen at Teheran THR 23/6/08. Ex RA-85689. 91A900 EX-85718 Kyrgyzstan Airlines, seen at Moscow DME 3/6/08 and Nuremberg 12/6/08 in service. Repaired after accident 26/9/06. 93A964 EP-CPT Caspian Airlines, seen at Teheran THR 3/6/08. Ex UN-85780. 93A979 RA-85795 VIM-Avia, seen at Moscow DME 24/6/08 in basic AviaPRAD c/s. 06A996 RA-85123 VIM-Avia, seen at Moscow DME 25/6/08 in basic AviaPRAD c/s. Will post some photos later on today. And if any aviation enthusiast out there is interested in information on some other types than Boeing and Tupolev, let me know! Bo, this reminds me of a magazine subscription I had for a few years in the early 90's called "World Airline Fleets News". It's format was much like yours. The magazine eventually went out of print and my subscription was replaced by another magazine called "Airliners Monthly News". WAFN also included a section on news and updates for aircraft and engine manufacture design and testing. I remember all of the aircraft status abbreviations you have posted. However WAFN had another abbreviation, "ex-" which meant the aircraft was registered with a previous operator, and who's name and registration number usually appeared immediately after the abbreviation. It sounds like you have a great magazine though. Do you have any good information on the final assembly and flight testing progress of the CRJ-1000 other than what Bombardier has on their website? (orders, deliveries, etc.) I'm trying to follow it closely since I hope to be flying it one day. Thanks! And yes, I remember WAFN. There have been a few other similar publications over the years. Some come and go! And we also use "ex", when we want to publish the previous operator or registration info for a particular aircraft. This is the info that we're publishing in AL-500 for the larger CRJ models. We don't track progress of flight tests, just when an aircraft changes ownership, or when it's first built, or scrapped, or whatever happens to it. CANADAIR CL-600-2C10 (CRJ701/702) c/n 10029 (701) N290RB Horizon Air, ferried Rockford-Toronto YYZ 28/6/08. Ferried Toronto YYZ-Goose Bay-Keflavik-Copenhagen 29/6/08. CANADAIR CL-600-2D15 (CRJ705)/CL-600-2D24 (CRJ900) c/n 15178 (900 NG) N607LR delivered to Delta Air Lines 16/5/08 and leased to Freedom Airlines. 15179 (900 NG) N924XJ delivered to Northwest Airlines 29/5/08 and leased to Mesaba Airlines. 15180 (900 NG) CX-CRD Pluna, ferried Montreal YUL-Providenciales-Manaus-Montevideo 3-4/6/08. 15181 (900 NG) N181PQ delivered to Pinnacle Airlines 29/5/08. 15182 (900 NG) C-FTZD ferried Montreal YMX-Keflavik-Luton-Istanbul 9-10/6/08 as BFO982. Ferried Keflavik-Goose Bay-Montreal YUL-Wichita 19/6/08 as BFO982. 15183 (900 NG) C-.... cld. 12/6/08. Delivered to Northwest Airlines as N925XJ and rgd. 13/6/08. Leased to Mesaba Airlines. 15184 (900 NG) C-.... cld. 17/6/08. Delivered to Northwest Airlines as N926XJ and rgd. 18/6/08. Leased to Mesaba Airlines. 15189 (900 NG) C-FULE Bombardier Inc., rgd. 20/6/08. CANADAIR CL-600-2E25 (CRJ1000) c/n 19991 (1000) C-FRXJ Bombardier Inc., rgd. 19/6/08. Converted from CRJ900 c/n 15991. NEW ORDERS: 4 CRJ700 NGs plus 4 options for an undisclosed customer. Announced 23/6/08. 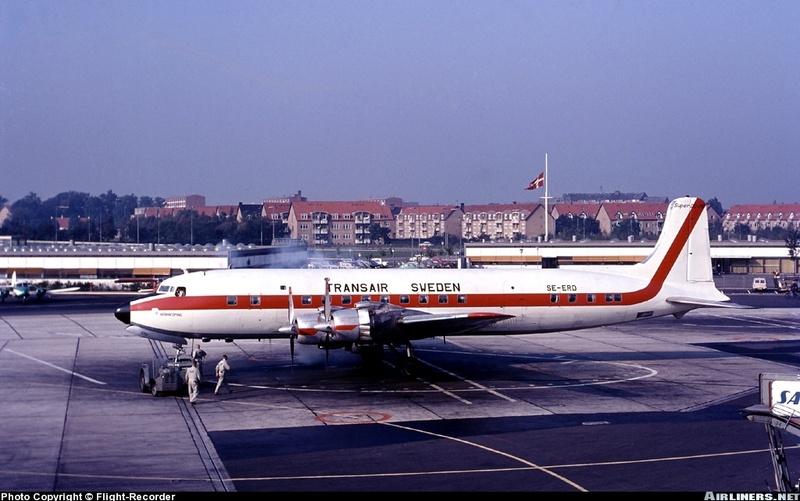 Incidentally, a few years after this photo was taken I worked at SAS Operations, in the building right behind the DC-7B. Lived in Malmö, and commuted on SAS' Malmö-Copenhagen flight (free of charge) when I had to go to work! So this photo brought back some memories! Lots of people from all over the world send us photos of interesting and colorful aircraft. We try to publish photos of aircraft that have unusual colorschemes, or happen to be unique in some other way. A good friend of mine, Kiyoshi, from Tokyo, has been a contributor for some 35 years and travels the world. This 747-400 began its life as a passenger aircraft with Malaysian Airlines in 1993. 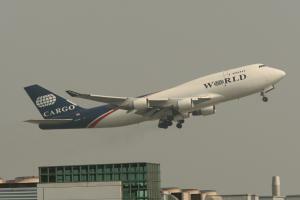 It was converted to freighter by Bedek Aviation in Tel Aviv in March 2008 and leased to World Airways at that time. Here Kiyoshi is capturing it as it's taking off from Hong Kong on 15 May, 2008. Another good friend of mine, Flemming, also used to work in SAS Operations at Copenhagen. He now lives in Las Vegas where he shot this Southwest Airlines Boeing 737-700 in a special color scheme which Southwest is calling "Illinois One". 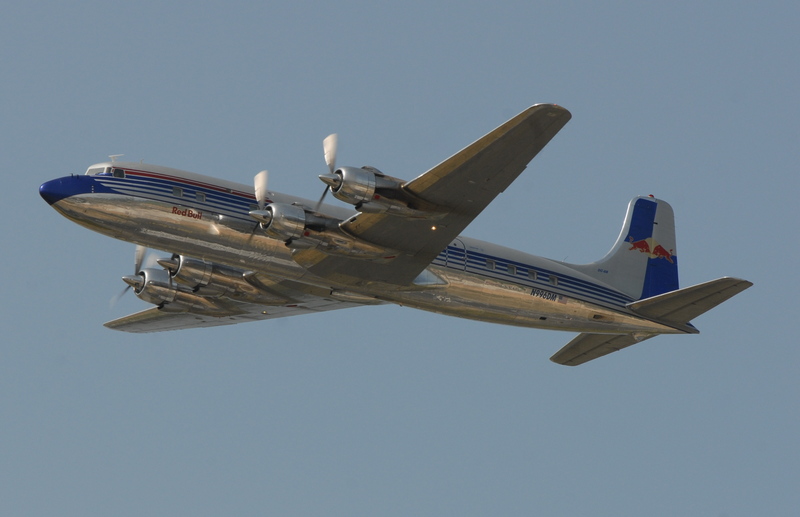 Just one more, for now: one of my favorite aircraft, the Douglas DC-6B. One of the best piston engined aircraft ever made. 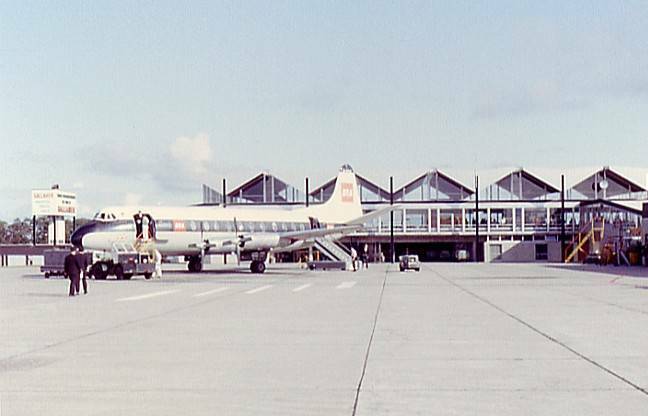 Made my first trans-Atlantic flight on one of these (Loftleidir Icelandic Airlines, Copenhagen-Oslo-Reykjavik-New York JFK in 1964. The Reykjavik-JFK flight by itself was 10 hours!). This one is owned by Flying Bulls GmbH of Austria, a subsidiary of Red Bull (the power drink). They spent millions (and years) restoring it to immaculate condition. This photo was taken at an Air Show in Berlin last month. This one was built in 1958, one of the very last to be built (the jet age had already begun and it was pretty much obsolete at delivery). Flew for JAT of Yugoslavia for many years. Job and wife keeps me busy. Bo- You primarily follow passenger aircraft, correct? I was lucky at one time to ride in a PT-17, T-6, Staggerwing, N3N, Ryan PT 13 and some others I can't remember at this time. I also landed in San Diego Bay in a Sea plane once also, that was fun too. Yes, every single commercial airliner built since WWII is in our database, with the complete transaction history (all operators, dates of sale, etc. ), as well as a number of related transport aircraft. For instance, since there's a commercial variant of the C-130 (=the L-100) we track every single C-130, including all the military ones (and all the ones that were destroyed in Vietnam for instance), but nothing below a 12-15 seater basically. So, even though I certainly know about Staggerwings, T-6s etc., these are not in our database, nor do we publish anything about them in Aviation-Letter. Can only do but so much! Can you name this aircraft? My father took this picture at Belfast Airport around 1961-1967. All I can tell from the photo is that it belonged to the airline BEA. Anything on "black project" aircraft sightings/platforms ? 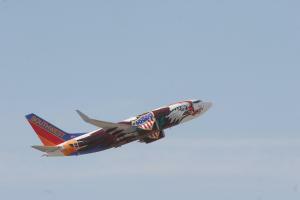 That Southwest paint job is really cool! It must be fun to see so many distinctive paint applications. So we finally got a peek at your publication, but I've always wondered who needs that information monthly? It's interesting that the older Boeing and Russian planes are notable for where they are "seen". I can see how the "Airline Route & News" reflects the ebb and flow of business and economic trends, expecially over time. It would be fun to create a visual chart of a 10-year time frame. (Ok, I'm weird like that. ) The "Aircraft Casualties" is kind of a downer, but it would be interesting to see a global map with dots pinpointing locations and color-coded to represent countries of origin or type of aircraft to see if there are any patterns. (There I go again.) Very interesting, thanks for the look inside your publication. Oh, and congratulations on the flawless publication record! So this begs the question, what was your biggest surprise over the years? Maybe one thought lost, that turned up years later in an totally unexpected location? That's a Vickers Viscount. 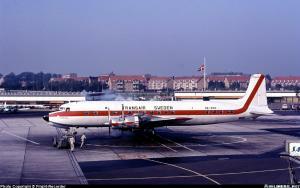 The Viscount, based on number of aircraft built and delivered was Great Britain's greatest commercial airliner, ever. Vickers built 444 of them, between 1948 and 1963, and delivered a total of 70 to British European Airways (BEA), the largest Viscount operator. BEA later merged with British Overseas Airways Corporation (BOAC) to form what is today British Airways. As of today, only 5 (five) Viscounts still remain in existence (in more or less operational condition). A couple of those are in storage. No, "black projects" are completely out of our scope. That being said, this is a fascinating part of aviation. I was just given (as a Father's Day present) "Sled Driver - Flying The World's Fastest Jet" by Brian Schul. This is an incredible book about what may have been the most incredible aircraft ever - the Lockheed SR-71. Highly recommended for anyone who is remotely interested! Thanks! You're touching on a whole array of different issues! The many different color schemes is part of what aviation enthusiasts find interesting. Many of them travel all over to take photos of different airlines' aircraft. Some are called "fleet collectors". They want a photo of each and every aircraft in every airline's fleet. In other words, if United Air Lines operates 100 Boeing 757s, they want a photo of every single one, even though the only difference between them is the registration number (N number). Many airlines also have temporary colorschemes to celebrate certain events, and of course photographers always try to get photos of those aircraft. The majority of subscribers are definitely aviation enthusiasts, and a sub group is what's referred to as "spotters" in the UK. Spotters hang out at airports, and all they are interested in is to check the registration number of every aircraft. If they havn't seen a particular aircraft before, then they make a note of the aircraft type and registration. I have to admit, I never quite understood this, but it's an inexpensive hobby. Well, as long as stay at the airport close to where you live. There are also some companies that subscribe, but those are definitely a very small minority. What's interesting to me is the similarity, in many ways, between the aviation enthusiast and palm enthusiast community. Both are worldwide (even though aviation covers ALL countries), and in both cases people travel to far away places to take photos of unusual aircraft - or palms. When I lived in Sweden I visited the USA on a number of occasions, typically spending 6 days at various airports taking photos, and then the 7th day I was so tired of aircraft I needed some regular sightseeing! And then after one day of R&R I was ready for another six days at the airport(s). Miami International was my favorite, because there were always obscure Latin American airlines that would show up. Airlines you'd never even heard about (mostly flying cargo). Accidents is of course a fascinating topic. And, yes, there is a trend. Most commercial airline accidents today happen in places like Nigeria, Sudan, Congo and Indonesia, with a few in Latin America thrown in. Even though Latin America today is much safer than it used to be. Back to aviation enthusiasts - many like to travel, and (especially in the UK) there are actually companies that specialize in organizing tours. Here's an advertisement that was published in Aviation-Letter earlier this year. All these tours are exclusively for aviation enthusiasts to be able to visit airports in these different countries. My biggest surprise...well, probably not what you'd expect! In the late 1980s we lived in the San Diego area. There was an old Boeing 720, built in 1961 and delivered to Eastern Air Lines, that after flying for Conair in Denmark, was sold back to the USA and placed into storage at Brown Field, near the Mexican border. I saw the aircraft on a few occasions, and it was in a miserable condition, so I decided to "retire" it permanently in our database, because it was obvious to me, this plane would never fly again. Well, after more than four years of storage it was sold to an Indian businessman, Rameshwar Verma who was planning to start up an Indian airline, Continental Aviation. He restored the 720 to flying condition (no doubt a major undertaking), and ferried it via Helsinki to Nagpur in India in Feb 1991. That was it. The airline never got off the ground, and the aircraft rotted away at Nagpur. It was still there on May 1, 2007. After I posted the above it occurred to me that there actually was a major surprise, but that was on a WHOOOOLE different level. The surprise came in early 2001 when Airbus announced they were launching the very large, 555 seat, A380. For many years (since the late 1960s) Boeing had the monopoly on the very large jetliner market with its 747. But beginning in the mid to late 1980s the market began to change with much more market fragmentation. Instead of most trans-Atlantic (for instance) passengers connecting thru New York JFK and then flying on a 747 to a major European hub, airlines began to operate twin engined jets (primarily Boeing 767s) from so called secondary cities in the USA, thus by-passing JFK. This trend has gradually grown to a point where more than 90% of ALL trans-Atlantic flights are now on twin engined jets. 30 years ago: not a single one! However, Airbus was always envious of Boeing's monopoly on the very large market, and the management at Airbus managed to convince the board that Airbus needed to build an ever larger aircraft (they had been studying it under the A3XX project name). I was convinced they were going to come to their senses and NOT launch the A380. But they DID. In the hundred years or so of commercial aviation there have been many expensive blunders and mistakes. The A380 is going to end up being - BY FAR - the most expensive of all these mistakes, and Airbus will pay for this for many years to come. In the more than 7 years since the A380 has been launched, they have received a total of 188 orders. So far in 2008: total 3 orders. When they launched it, they announced they needed 270 orders to reach break-even. Sheer fantasy. After they had received 150 orders, they announced a revision; now they needed 420 orders to reach break-even. In other words, they now needed an additional 270 orders. Which was exactly their initial number! In other words, the first 150 planes had been sold at a price where Airbus is making no profit whatsoever. Problem for Airbus is that this is a buyer's market. Any airline placing an A380 order will expect a BIG discount. And without that big discount, no orders. Boeing, on the other hand, and let me stress, not a company that's necessarily opposed to making big blunders, did the smart thing: they checked REALITY. And reality, since 1985, has been a major trend towards medium sized (220-300) jets. They launched the Boeing 787 in July 2004, exactly four years ago, and more than THREE YEARS AFTER Airbus launched the A380. As of right now, Boeing has 896 orders for the 787! This is an absolutely astounding number of orders. No other commercial aircraft EVER launched has had more than about 150 orders at the time of the first flight. The Boeing 737 - the most successful jetliner ever built had 140 orders at the time of the first flight of the first 737. As of today, Boeing has received orders for almost 8,000 737s. The big problem for Airbus is this: they will gradually build up the production rate to 4 per month, i.e. 48 per year. This will happen in 2010-2011. Once they get to that point, they will also need to take in AT LEAST 48 new orders every single year in order to be able to maintain a cost effective 4 per month production rate. They will NOT be able to do this, and will have to gradually reduce production in order not to completely run out of orders. When they get down to a production rate of 1 aircraft per month, it's desperation time, because at this point any airline placing an order will be able to dictate exactly what they want, and Airbus, in order to continue production will have very few options. Airbus has convinced itself it will build 1000, or so, A380s over the life of the program. Will never happen. May 400-450 at most. And with lots of money wasted. Incidentally, for a variety of reasons, the Airbus management team that was responsible for the A380 is now out the door. And many of them are facing criminal charges. But not for the A380 decision. Bo, good discussion on the A380 program. Something else to consider, dropping down the production rate causes delays in delivery dates. At some point the delivery dates will become excessively long. Airline'.s growth and business plans are usually based on aircraft availability. If delivery dates become excessively lengthy then it will become economically unfeasible for the airlines to wait that long for their aircraft. What results is airlines will go to another fanufacturer who can better accomedate their time lines. Fedex had previously ordered a number of A380's. When Airbus announced the program delays, Fedex then canceled their orders with Airbus and placed an order with Boeing for 777's instead. You're right about FedEx, and it was actually also UPS. FedEx and UPS had BOTH placed orders for 10 A380 freighters each. When Airbus began to run into production difficulties, both FedEx and UPS cancelled their orders. FedEx ordered 777 freighters instead, and UPS ordered a whole bunch of 767 freighters, so that was a big loss for Airbus and a big gain for Boeing. Emirates Airlines and International Lease Finance Corporation also had orders for the A380 freighter but they both switched those orders to passenger versions. The end result for Airbus: they now have ZERO orders for the A380 freighter. Boeing on the other hand has launched the 747-8 program, with the main emphasis on the 747-8 freighter (due out next year). They already have 78 orders. This freighter will dominate the large freighter market for at least the next 20 years, and Boeing, interestingly is likely to have a monopoly on the market. The irony in the situation is that Boeing probably would never have launched the 747-8 program if it weren't for the launch of the A380 program! Boeing will also build a passenger version of the 747-8 but as of now they only have 20 orders (all from Lufthansa). 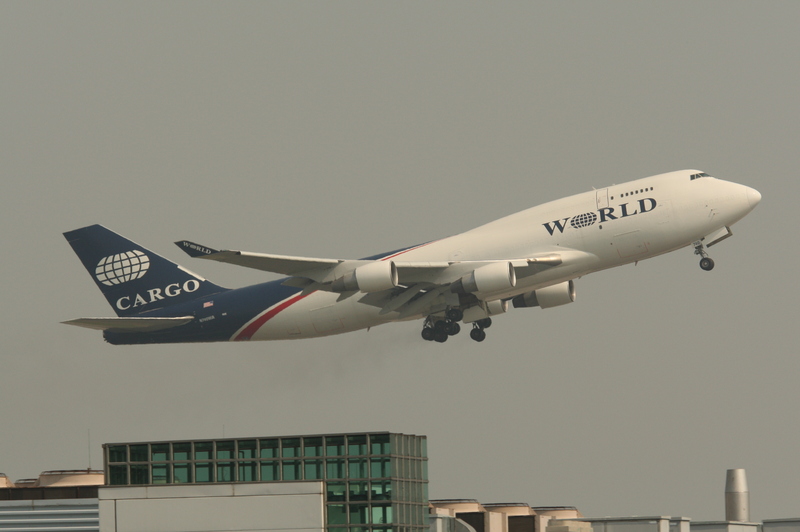 Well, plus 7 orders for the executive version of the 747-8 as well. But as long as the freighter version is successful, any 747-8 passenger sales is just a bonus and a good way for any airline looking at the A380 to get bargain prices since they can play they two against each other! Incidentally, in this age of computers and technology, the production difficulties that Airbus ran into were just plain silly. The German and French computer software was not compatible. Apparently, the Germans didn't want to tell the French about the difficulties they were having and the French didn't want to tell the Germans... End result - the first 28 (or so) A380s were all built with wiring that didn't hook up where it was supposed to hook up. And they have something like 500 km of wiring in each of these giants. Every single plane had to be completely re-wired, and the program is at least two years behind schedule. Of course, Boeing also had its difficulties with the 787, and those problems were - at least - just as silly. The various main subcontractors in Japan, Italy and South Carolina were all supposed to install all the wiring and then ship major parts of the aircraft in specially converted 747 freighters (called Dreamlifters) to the plant at Everett north of Seattle. And Boeing's great plan was to then simply put all the major components together at the Everett plant in a few days. Unfortunately, the subcontractors ran into serious problems and were NOT able to install wiring etc when they were supposed to, so they simply shipped the major fuselage components to Everett WITHOUT the wiring! (Why Boeing didn't have inspectors at those locations is an absolute mystery!). Interestingly, exactly a year ago, on July 8, 2007 (7-8-07) Boeing rolled out the very first 787. Tom Brokaw had been invited as the main speaker, and it was all over the news. Unfortunately for Boeing, and all the airlines that had placed orders, the "aircraft" that rolled out a year ago was just an empty shell, with no wiring and nothing in the cockpit. It was no more capable of flight than my kitchen sink! But Boeing is making progress and planning for first flight later this year. And as of yet, not a single cancellation despite the (more or less) two year delay in the program! Interesting info Bo. Thank you. What have you heard of the 787's overweight issues? Rumour is that it might negate the fuel savings!!! As with ANY new commercial design, the 787 has weight issues. Based on the information I have, Boeing seems to be fairly confident that they will be able to more or less get the weight to where it's supposed to be - or at least real close. That's in contrast to Airbus, which already now (at a much earlier stage in the design phase) began to run into weight problems with their new A350. They simply decided to increase max gross weight by a couple of tons. Which of course will impact performance and fuel economy. Secret, black project aircraft have always interested me. The SR-71 is one of the most incredible planes ever built, and to think it was originally designed in the late '50s without the aid of computers. I read about a variant they were designing called the Yf-12 that was going to be an interceptor but then the project was killed. Another story I found interesting about the SR-71 concerned the drone that was designed to launch off the back. They only used it a few times. One time was over China in I think the early 70's. The drone was launched but they lost control of it and it just took off and disappeared. It happened to have crushed in southern Russia. In the ealy '90s after the collapse of the USSR, Russia turned over wreckage to the CIA and asked if this was part of a new stealth program. They just laughed and said it was from a long time before. I like the story also of how they obtained the titanium to build it. The USSR was the biggest supplier so the CIA set up front companies to import it then build a super spy plane from it that spied on them. I've seen the one at the new Air and Space Museum annex near Dulles Airport in Washington DC and the one at the AirZoo in Kalamazoo, MI. Also have seen the ones in Palmdale,CA down the street from Skunkworks in Blackbird Park. Its a very ominous looking plane. I can imagine the looks and thoughts of the first people to see the hangar door rise and this sitting in there in the early 60s. It still looks exotic now so imagine 45 years ago. Also, did you see this story ? Thank you Bo, I hope they can pull it off. No, didn't see that story. Very strange! Delta Air Lines currently has 6 outstanding Boeing 777-232LR orders, and those six will all be delivered between Dec 2008 and March 2009. Delta received its first two 777-232LRs in Feb/March this year. This particular 777 model has not been all that successful. There are currently only 20 of them flying worldwide (Pakistan International, Air Canada, Emirates and Air India) and a number of airlines have actually switched their 777-200LR orders to the larger (and more economical) 777-300ER. Delta also has 44 outstanding 737 orders (-700 and -800 models). Are you flying the 767 for Delta? It will be interesting to see if we delay the delivery of some of these aircraft due to the current fuel environment, I hope not. I fly both the 767 and 757 as I am dual typed. Edit: And thank you for the Delta info. As you know, Delta has been very aggressive in opening up new longhaul routes over the last couple of years so delaying those six new 777s is extremely unlikely. Plus the fact that Delta currently only has two 777-232LRs in the fleet always makes fleet planning a bit of a challenge in case of mechanical problems, so I'm sure they're really looking forward to March next year when they will have eight of them in the fleet. Which is not a big number for an airline the size of Delta. Here's one of the 757-200s (with blended winglets) that Delta acquired recently on lease. One of 17 that initially were delivered to TWA and then became part of American's fleet when AA took over TWA. And don't you hate it when this happens...! 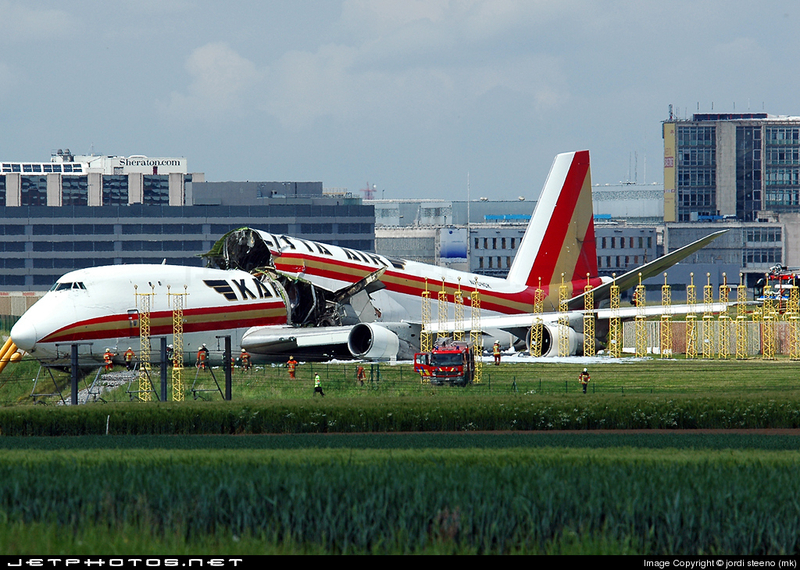 Kalitta Air, a U.S. cargo operator, lost this 747 after an aborted take off at Brussels on 25 May, 2008. Fortunately no casualties, though. It's a 28 year old aircraft. No way are they going to waste millions on it when there are plenty of others available. And that WOULD be one extremely expensive repair. Usually, even with newer aircraft when something like this happens, it's an automatic write off. Yes, and I'm sure Boeing is thrilled as well! Will be interesting to see how long they're going to take this time! Thanks, Bo, for sharing some of your life story with us. As a bit of an aviation enthusiast myself, I've always been interested in learning about your publication, and I'm quite impressed with the depth and breadth of the information that you present. I'm also quite impressed whenever I see someone who is able to turn an interest into a livelihood. Perhaps you're starting that over again with your Clinostigma seedlings. By the way, my dad was a pilot, although not a career one, and rated for the DC-6B. I never expected to see a picture of one on Palmtalk, but it was a pleasant surprise.